There have been many things people have been fascinated with; a variety of peoples, places, things, and events that are “coveted” in talking, discussing, debating, or just simply to be intrigued about from the past to something prevalent in today’s world (and society). Perhaps one of the most “intriguing” in United States history is the allure / fascination of the legacy of the Kennedy family. The Kennedys, a powerful and famed family, have always been a subject to talk about and to marvel over, examining the highs and lows that they’ve faced over the years and that somewhat “guarded” history that the family keeps shrouded in mystified secrecy. Additionally, the family has had a “one foot” in US politics, including John F. Kennedy serving in the oval office as the 35th President of the United States. Even Jackie Kennedy, president JFK’s wife, coined the phrase “Camelot” (a reference to the mythical kingdom from Arthurian legend) for the Kennedys, a name referring to their glory and marking the family’s place on US history. It’s also been said that the Kennedy family has been cursed (the now infamous “Kennedy curse), with the family facing many tragedies (i.e. assassinations and unexpected deaths) that have stained and lined their legacy’s path. Of course, Hollywood has also taken a shine and fascination to the Kennedy’s legacy as well, producing a plethora of documentaries on the subject of the “Kennedys” as well as theatrical motion pictures, with most gravitating towards JFK’s presidency and his assassination (and its immediate aftermath). This includes movies like 1991’s JFK, 1993’s In the Line of Fire, 2011’s Lee Daniel’s The Butler, 2013’s Parkland, and 2016’s Jackie. Now, Hollywood gears up for a new cinematic tale on the subject of the Kennedys as Entertainment Studios Motion Pictures and director John Curran present the movie Chappaquiddick, the famous story revolving around Ted Kennedy. 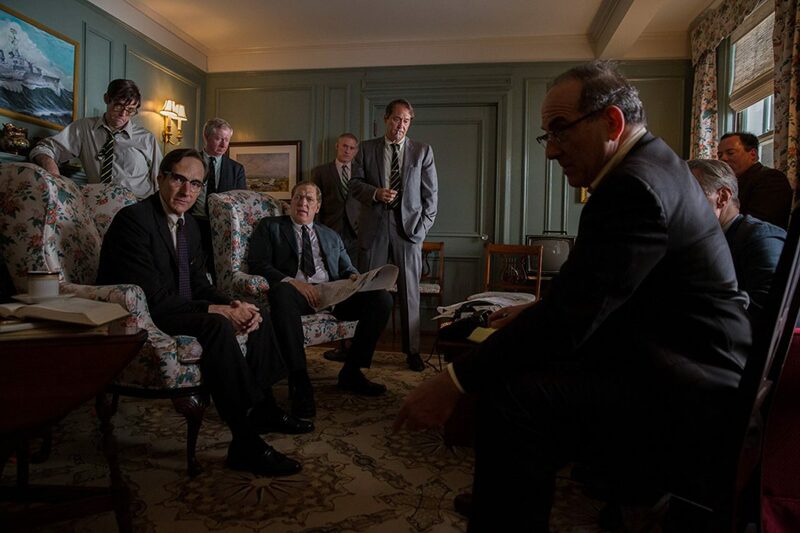 Does this latest bio-pic shed light on the 1969 incident or is just another run-of-the-mill Kennedy movie? On July 18th, 1969 (a few days before Neil Armstrong and Buzz Aldrin landed on the Moon), Massachusetts senator Ted Kennedy (Jason Clarke), after participating in the Edgartown Yacht Club Regatta, held a private gathering and friends, including Ted’s cousin Joe Gargan (Ed Helms), Massachusetts District Attorney Paul F. Markham (Jim Gaffigan) and the “Boiler Room Girls” (a team of six female staff members that worked underneath the recently deceased Robert F. Kennedy). As the night went on, Ted warms up to one of the girls, Mary Jo Kopechne (Kate Mara), with the two leaving the cottage and sharing an imitate conversation on things, including Robert’s memory and Ted’s future prospects of running for President in ’72. However, on their way back, tragedy strikes the pair as Ted drives his car off the narrow Dike Bridge on Chappaquiddick Island, Massachusetts. While Ted survives and escape the submerged overturned car, Mary Jo is trapped inside the car and ultimately drowns to death sometime shortly after. Ted, dazzled and confused, retreats back to the cottage, alerting Gargan and Markham of the situation he’s in as the three begin to plot their next move. As the next day begins, the events of what happened quickly beginning to be expose to the public, with the press clamoring for answers from Senator Kennedy, as Ted returns back to the Kennedys estate in Martha’s Vineyard, seeking advice from his elderly father Joseph P. Kennedy (Bruce Dern) and his team of legal advisor, ready to assist Ted on the right moves to make next. As story of what happened slowly starts getting leaked to the nation, Ted wrestles with his conflicted ideologies of telling the people (the nation) the truth of what really happened or to protect his family’s legacy name. To say that the name “Kennedy family” is a common (almost household name) with many people is simply an understatement. Many individuals out there (in some way, shape, or form), at least know of some small notion of who the Kennedys were and some of the events that these faced, be it good, bad, or indifferent under the circumstances. To me, the whole fascination of the Kennedys is somewhat as intriguing as some people out there, but there’s an unspoken allure that I find curious to this family dynasty. Naturally, like most individuals out there, my first introduction to this family was through President John F. Kennedy and the whole assassination event in 1963 that shook the entire nation. You’ll guys will probably laugh at this, but before I learned about President Kennedy in my school’s history class, I actually learned about him in Forest Gump (again, another reason why movies played an important part in my life…haha!). From there, I learned about him (more depth on him and his family’s legacy and about the whole “Kennedy curse”. What I find interesting (in studies of the family) that at least one Kennedy family member has served in the federal elective office from 1947 to 2011 and then from 2013 to the present; span a time that’s more than a quarter of the United States’ existence. Wow…. that’s quite impressive if you think about it. I also find it interesting at how guarded the family is in their role in history and the shroud of secrecy that surrounds them (i.e. look at how Jackie Kennedy is portrayed in the 2016 film Jackie and you’ll know what I mean). Almost every other year, some type of new biographical book, a History Channel documentary, a TV miniseries, or a feature film gets released that covers (or uncovers) some type of new secret or some bold portrayal of the Kennedys. Of course, I’ve seen many of them, a few of the documentaries and several of the feature films out there (i.e. In the Line of Fire, Forest Gump, JFK, Lee Daniel’s The Butler, and Jackie); removing an outer layer on what I thought of the Kennedys and slowly shedding the mystery behind their dynasty that they left behind. Like I said, it’s pretty weird and interesting allure in talking about and / or examining the legacy of this powerful family. This, of course, brings me back around in talking about the movie Chappaquiddick, the latest tale to be told in the cinematic iterations of the Kennedy family saga. To be honest, I didn’t really hear that much internet buzz about this movie and I just recently saw the film’s theatrical movie trailer However, seeing the trailer peaked my curiosity to see the film, especially since it wasn’t a centrally focused on the JFK assassination as well as the recognizable cast of the film (i.e. Clarke, Dern, Helms, Mara, etc.). Thus, I decided to give the movie a try (in theaters) and went to see Chappaquiddick. What did I think of it? Well, while I found that there were some problems in the movie, Chappaquiddick is an interesting motion picture that elevated by its narrative and by its cast. It may not be the best Kennedy film out there, but it’s allure and fasincation within the Kennedy’s mythos is there. Chappaquiddick is directed by John Curran, whose previous directorial works include the films Praise, Tracks, and The Painted Veil. Given the whole fascination with the Kennedys, Curran approaches the whole Chappaquiddick incident in the film as piece of an “untold” tale (i.e. a somewhat “another side, another story), revealing the events that were mentioned (to the public), but now being told by Ted Kennedy’s views, which were hid from nation for quite some time. To be quite honest, I was really interested in the Chappaquiddick narrative. Like I said, I hear a lot about President Kennedy (his presidency, his “new frontier” speech, and his assassination) via various outlets from history classes to feature films, but not much is said about Ted Kennedy (at least in the media outlets). Of course, if you know about the Chappaquiddick incident of 1969, then you’ll probably know the film’s outcome. However, the way how it gets there is what makes the film interesting. Thus, it was a bit somewhat refreshing to hear about another Kennedy (Ted) rather than Jack (aka Jack) and / or his assassination in 1963. Naturally, the film’s screenplay, which was penned by Taylor Allen and Andrew Logan, mainly focuses on the events of Chappaquiddick incident, making Ted Kennedy one of the primary characters of the feature in how he handles this events in both the right and wrong way. Interestingly, the movie also focuses on the immediate aftermath of the car crash, exploring the bewildering state that Ted goes through (as some might do as well) in trying to fully cope and wrap his head around. Even more interesting is the somewhat disenchanted notion that he gets following the accident, stating “I’m not going to become President” or something like that (it’s along those lines) rather than stating the horror fact that he killed an innocent woman. By extension of this notion, Allen and Logan keep the mythos legend of the Kennedy prevalent alive in the film, most notably with John F. Kennedy’s legacy via his speech of “going to the moon”, which the film takes a few days before the Moon landing in 1969. Given that notion, I felt that the film was trying to give Ted a more dramatic role, trying to measure himself as “Kennedy” during this time and trying not his fatal mistake tarnish the family name. Of that notion, I liked it and I kind expected to John Kennedy (aka Jack) to be mentioned in the movie in some way, shape or form. To be truthful, at the end of the film, I felt mad and angry over what Ted Kennedy did (and the overall outcome of what became of it) and I think that’s what Chappaquiddick wants to achieve; shedding light on a very secretive / scandalous tale of their family’s legacy. This, of course, goes back to how the political world works, with individuals and / or families of power and privilege are allowed to exercise certain things to make “their version” come out more favorable to them than the actual truth. There are many cases of political people using this tactic, but I’m not going to name names as I usually stay away from taking a political party stance in my reviews. So, I’m just going to leave it like that. Nevertheless, the themes in Chappaquiddick of men of privilege (and the choices and consequences they make) are prime example to examined throughout some friendly heated debates among many out there. On presentation viewpoint, Chappaquiddick is a well-made and well-crafted feature film. A lot of the movie’s camera angles have a certain creative edge to them, given some unique shots throughout the film. While it’s not a necessarily aspect in a bio-pic, it works effectively, adding a layer of moviemaking quality to the film’s proceedings. Thus, I have mention cinematographer Maryse Alberti for her efforts on the film. The rest of the film’s technical / visual aspects and nuances are concrete within the film’s time period and setting. From the late 60s clothing outfits and attire by the film’s costume designers, to the various locations (including inside the Kennedys Martha’s Vineyard estate) by production designer John P. Goldsmith and set decorations by Jennifer Engel, the movie certain does capture that look and feel of the upper-class Massachusetts life and times within this timeframe. Also, the movie’ score, which was composed by Garth Stevenson, is also good, playing its melodic underscore soundtrack throughout the film. There was one melody track that keeps on playing throughout the movie (I can’t remember it fully), but I liked it and sort of felt like the Chappaquiddick’s underlining theme. 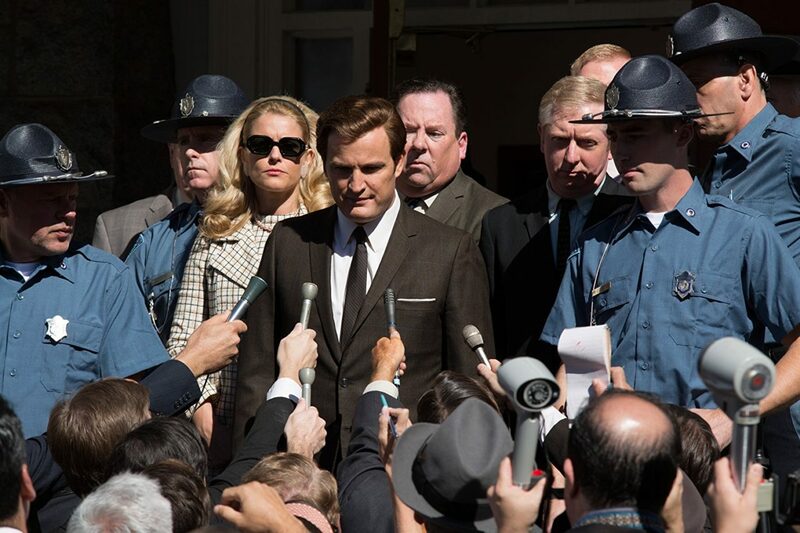 Despite the fascinating piece of untold story in the Kennedys history and the well-crafted technical presentation of the film, Chappaquiddick isn’t the most theatrically riveting motion picture its sets out to be, faltering in some areas in the film’s execution. Perhaps the most prevalent and problematic piece of the feature is the overall pacing and plot beats that make up the film. The movie, which runs 101 minutes, feels much longer than it should’ve been. What I mean is that the film is slow-burner with several parts that drag, most notably in the aftermath events of the fatal accident. Yes, while I praised Curran’s direction by showing “event by event” of what Ted faced in the immediate aftermath of the crash, but it becomes a bit too much and seems to consume a lot of the film’s running time, which ultimately makes a large bulk of the movie’s first half a bit lethargic in its pacing and in keeping a viewer’s attention. Additionally, the film quickly jumps into the world of Ted Kennedy, trying to establish many of its character too quickly. Thus, the character of Mary Jo Kopechne comes off as one of the weakest characters of the cast, which disheartening as she is the somewhat focal point of the narrative being told. There’s also a few parts that could’ve been explained better and / or handled better with allowing more time (in explanation or in theatrical motion picture cinematics) to convey the right dramatic entertainment that’s captivating and compelling. One example is Ted Kennedy’s wife (Joan Bennett Kennedy), who appears in the movie and played by actress Andria Blackman (My Best Friend’s Girl and A Deadly Obsession), but is barely in it. It would’ve been interesting to hear (or rather see) what she thought of the whole Chappaquiddick incident in the movie…maybe even a heated / angry dialogue conversation between her and Ted would’ve been a nice addition. Thus, in my opinion, I believe that Chappaquiddick should’ve been made for the “small screen” to be reworked out as a TV miniseries. This would allow the story “to breathe”, filling in some of the gaps that take place before, during, and after the car accident. If someone like HBO, who is known for their TV movies and miniseries, this could’ve something quite interesting and memorable (a possible contender for some nominations during the award season). Unfortunately, Chappaquiddick goes for the big screen feature film agenda and does quite find its stride on the silver screen. Additionally, much like how the film Jackie portrayed the movie version of Jackie Kennedy as a vicious, cold-hearted, and self-absorbed woman (although I think that’s probably accurate), Curran (along with Allan and Logan) make the movie version of Ted Kennedy in Chappaquiddick a somewhat buffoon / fool. Yes, he’s powerful state senator from such a prestigious family, but he just seems (in the movie) he’s making stupid and incoherent decisions, portraying Ted Kennedy as a person who has lost his way…. not because of the death of Mary Jo Kopechne, but rather his dreams being dashed of being the future president of the United States. Because of this, there’s not much to Ted’s character development, beyond the character acting and reacting to the events and “being told” what to do. Bio-pic feature films usually delve into the mind of a famous individual in a somewhat “psychology character study” of sorts to bring to light (a cinematic light) the reasons behind what they did. Unfortunately, Chappaquiddick has a hard time in developing the psyche into Ted’s mind, with movie only presenting Ted as a man who fears letting down the family name, which makes him less of juice / meaty role and more of a curiosity interest. Whether that’s how the real-life Ted Kennedy acted during the true-life Chappaquiddick incident or not remains a mystery. Regardless, the film’s screenplay could’ve (and should’ve) been a bit more beefier and sharpened more finely, giving the feature its dramatic punch (and human connection) that it so desperately needs. The cast in Chappaquiddick is small but effective group talented actors and actresses in bringing these real-life characters to life. Leading the charge is actor Jason Clarke, who portrays the film’s central main character Ted Kennedy. Clarke, known for his roles in Lawless, Zero Dark Thirty, and Dawn of the Planet of the Apes, has mostly been a “supporting” player in the feature films he’s done, but Chappaquiddick sees the actor step into a movie’s leading role. True to his acting ability, Clarke does quite an impressive job as Ted Kennedy, elevating the character of expressing the duality within Ted (one being the proud and powerful senator that bares the Kennedy name and the other a fearful and dazzled man that faces a terrible incident). Like I said, the movie could’ve explored a bit more on the psyche character development within Ted, but that’s not on Clarke’s performance but rather on the film’s screenplay and / or Curran’s direction with the movie. Still, Clark gives a solid performance in the role and does have that “commanding” presence as the film’s main lead. Likewise, the same can be said for the character of May Jo Kopechne, the other fixed pointed character that surrounds the whole Chappaquiddick incident, who is played by actress Kate Mara. Known for her roles in Megan Leavey, Morgan, and House of Cards, Mara handles herself well on-screen as Mary Jo, giving her a likeable quality from the get-go and painting her as a sympathetic martyr of which befalls the aspiring political strategist. Unfortunately, like I said above, the movie quickly brings her character into the narrative and gets rid of her (i.e the accident) in the same fashion, leaving very little character insight / development in Mary Jo beyond being the victim to this whole scandal cover up affair. In more supporting characters, perhaps the one that stands out the most would have to be actor Ed Helms as Ted’s cousin and close lawyer / confidante Joe Gargan. Known mostly for comedian roles in The Hangover trilogy, The Office, and Father Figures, Helms gives a very solid and impressive performance as Joe, displaying a more serious / drama side to his acting ability. Within Joe, Helm’s character as the “voice of reason” for Ted, trying to guide his cousin on the right path in trying to navigate through this messy turn of events. While he may not be recognized for this role in the next award season (of which I think he should be), Helm’s portrayal of Joe Gargan is definitely (in my opinion) one of his more memorable, especially since its in genre / character role that he’s not known for commonly playing. Behind Helms, actor Bruce Dern, known for his roles in The Hateful Eight, Nebraska, and Big Love, does a great performance as Ted’s father Joseph P. Kennedy. While it’s a role that doesn’t require a lot of talking (Joseph Kennedy had a stroke, rendering him mostly unable to talk), Dern seems to relish the opportunity to display his acting talents in a role such as this, which he does beautifully. To me, Clarke, Helms, and Dern are the true standouts in Chappaquiddick. The rest of the film’s cast are in more smaller supporting roles, filling in their respective moments within the movie’s events. This includes comedian / actor Jim Gaffigan (Chuck and My Boys) as District Attorney for Massachusetts Paul F. Markham (Gaffigan gives a surprisingly good performance), actor Taylor Nichols (Barcelona and Jurassic Park III) as lawyer, speech writer and loyal Kennedy adviser Ted Sorensen, actor Clancy Brown (The Shawshank Redemption and Starship Troopers) as former US Secretary of Defense and loyal Kennedy adviser Robert McNamara, actor John Fiore (Person of Interest and Patriots Day) as Edgartown Police Chief James Arena. The untold story behind 1969’s Chappaquiddick incident, involving Senator Ted Kennedy, is brought to cinematic life in the film Chappaquiddick. Director John Curran’s latest movie, examines the infamous accident that took place in Chappaquiddick, Massachusetts, telling the somewhat “unknown” version through the eyes of Ted Kennedy and the powerful advisers that aided him. While the film has some uneven pacing and lacks a resounding cinematic footing (as well as filling in some missing gaps in the story’s narrative), the film is still an intriguing piece within the history context being told and its cast, despite some not being fully developed, give solid acting in their respective roles. Personally, I thought this movie was okay. It was a very fascinating story to be told (and was well-acted), but the film could’ve been better in certain areas. Like I said, it was an interesting, but not riveting. Thus, I would probably say that I would give Chappaquiddick a favorable “rent it” stamp of approval as it’s really not a “must see” movie to see in theaters, but it’s still good enough to be seeing as a rental once or twice. Reiterating to what I said at the beginning of my review, the Kennedys have made their mark upon US history, displaying power, privilege, and scandal with this well-known and prominent family that guards their legacy (and their scandalous secrecies) in an unforthcoming manner. As it stands, Chappaquiddick, despite it’s flaws, uncovers another shroud of mystery in the Kennedys tainted family history, which will make people even more fascinated with the antecedent of this political American family. In the end, power and lies goes hand in hand with the Kennedys and Chappaquiddick strongly solidifies that idea. It’s becoming interesting to see how many triple-bills and double features can be put together, fusing films depicting real events of recent history. Jason, your reviews are always so in depth and insightful. Keep up the strong work my friend. Thank you, my friend. I appreciate your comments (always) and for your continuing to read my reviews.